Formerly known as Jack. JavaCC is a parser, like YACC (Yet Another Compiler Compiler), except that is it written in Java and generates Java code. It started out handled by Sun, then by Metamata, then bought out by Webgain, who went belly up. It is now an open source project. The current version is 6.0 Last revised/verified: 2017-02-12. 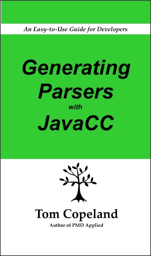 It is still the most popular parser written in Java. JavaCC is similar to PCCTS (Purdue Compiler Compiler Tool Set). JavaCC is a LL(k) (top down) parser, whereas YACC is a LALR(1) (Look Ahead Left-to-Right parse, single token look-ahead) (bottom up) parser, so the grammars look quite different. The documentation is quite readable, unlike most of its competition. The parser has some parsing speedup tricks like lookahead and custom code for the tricky bits. JavaCC has been stagnated, but it showed some signs of renewed life with a recent release. Most new parsers are written in ANTLR. JavaCC is more intuitive and better fit for getting your feet with parsers. It blew my mind when a little parser I wrote worked first time. It is much simpler than it first looks. The easiest way to learn is to study the *.jj example grammar descriptions and to Google for example source code for JavaCC code for grammars similar to what you want to tackle. You write little methods that describe the various phrases of your grammar. They are a mixture of Java code and JavaCC grammatical BNF (Backus-Naur Form). JavaCC then merges them and converts the whole thing into pure Java source code, with methods that will recognise the various phrases. When you compile that, you can parse text. In addition there are commands to describe the tokens of your language tokens — the basic units/words. Dongwon Lee used to maintain a list of JavaCC grammars but abandoned the project. I wrote him, but he did not write back. I used the Wayback Machine to recover some of his snapshotted it to be discarded. Please pass on new submissions and updates. The email addresses displayed below have been munged with Masker to discourage spam harvesters. They are not copy/pastable or extractable from the HTML (Hypertext Markup Language), so you will have to retype them into your email program because they are *.png images, not text. Ada John R. Callahan 1998-06-04 Rudimentary Ada9x grammar. ASN.1 Helena Sarin 1998-03-20 ASN.1 grammar ITU Recommendation X.208. C++ Theodore Norvell JavaCC parser. Coming soon. DTD download Theodore Norvell 2011-02-09 A JavaCC parser for content models as found in XML’s DTD files. It doesn’t parse the whole DTD file, because SAX can do that, but SAX doesn’t parse the content models. It may be out of date. DTD download John Gebbie 2001-03-27 Almost-complete grammar file to parse XML DTD 1.0.
download John D. Ramsdell 1997-01-20 Part of JavaCC package. Parses the output from du (disk usage summarization program on UNIX) into nested parenthesized lists. The parser was developed for an old version of the Disk Usage Tree Map Viewer. The latest version does not run du as an inferior process, so the parser is no longer used. Express download Jason A. Goodman 1998-10-26 Grammar for the EXPRESS product representation language as defined in IS0 10303-1 which covers industrial automation systems and integration, product data representation and exchange. GDMO download Dermot Dwyer 1999-04-19 ISO/CCITT Guidelines for Definition of Managed Objects (GDMO) into UML. HTML download Part of JavaCC package. Covers HTML 3.2 specification. HTML Brian Goetz 1999-11-03 1.0 This is a JavaCC grammar for parsing HTML documents. It does not enforce the DTD, but instead builds a simple parse tree which can be used to validate, reformat, display, analyze, or edit the HTML document. The goal was to produce a parse tree which threw away very little information contained in the source file, so that by dumping the parse tree, an almost identical copy of the input document would result. The only source information discarded by the parser is whitespace inside of tags (i.e., the spaces or newlines between the attributes of a tag.) It is not confused by things that look like tags inside of quoted strings. IDL download 0.1 Part of JavaCC package. A grammar for the IDL (Interface Definition Language) of OMG CORBA 2.0 specification. download Michael McConnell 2002-01-19 1.1 InfoSapient Business rules engine. InfoSapient is a business rules engine used for the expression of policy or operation rules within a business. Java Sriram Sankar Part of JavaCC package. Sriram Sankar is the original author of JavaCC and continues to maintain it. Java 1.4 Theodore Norvell JJTree parser. Coming soon. Java to HTML download Paul Cager 2001-12-19 1.0 JavaCC grammar to convert Java or JavaCC code to HTML. download James Power 1998-11-17 A parser for the programming language Oberon-2. Oberon is the latest generation in the Wirth family of languages, an heir to the Pascal and Modula tradition. ODL download Vladimir Rubanov 1999-07-23 0.1 ODMG Object Definition Language (ODL). The language is based on IDL and is specified in ODMG 2.0 standard. Production numeration corresponds to this standard. The grammar is tested and used at the Institute for System programming of Russian Academy of Science. OGNL Drew Davidson 2002-04-05 OGNL stands for Object-Graph Navigation Language; it is an expression language for getting and setting properties of Java objects. You use the same expression for both getting and setting the value of a property. OQL download Koen Hendrickx 1997-09-25 (Unfinished Version) Object Query Language (OQL) defined in ODMG 2.0 specification. PGN download Martin Rademacher 2001-08-28 6.5 PGN is Portable Game Notation. For more information see the Wikipedia PGN entry. PHP download Satyam 0.1 Parses PHP 5.0 grammar. Tested with the PHP 5 test suite, except for exceptions noted in the TODO list contained in the source. Python download Jim Hugunin 2.0 Part of JPython package. Python is an interpreted, interactive, object-oriented, extensible programming language. Dongwon Lee 2000-08-17 0.9 QuiltParser is a parser for the Quilt XML query language written with JavaCC as a part of XPRESS project at UCLA / CSD. This small, implementable language has been recently proposed by Robie, Chamberlin and Florescu; it integrates the advantages of various languages while meeting the W3C’s XML Query Requirements. Rational Rose download Markus Dahm 2001-06-18 1.11 A JavaCC grammar for models created by Rational Rose. The Homepage of the CrazyBeans project. RMAIL download Part of JavaCC package. Processes RMAIL files that are created by the GNU emacs editor. RPC download Adelene W. Ng 2001-06-26 0.1 RPC (Remote Procedure Call) Specification grammar; tested on JavaCC 2.0. RTF download David Rosenstrauch 2001-10-11 1.0 A grammar for RTF (Rich Text Format) documents (frequently used with the Microsoft Word word processor, as well as several others). RTF download Eric Friedman 2001-10-31 JavaCC grammar for parsing RTF files. This parser handles unicode RTF as well as double byte RTF files used to represent Asian character sets. Jar file includes the RTFParser.jj grammar, source for a parser delegate interface for applications to implement when they need to respond to RTF events and a copy of the LGPL license. Simkin download Simon Whiteside 2001-01-02 1.1 Simkin is a high-level lightweight embeddable scripting language which works with Java or C++ and XML. Rukhsana Alam 2001-06-15 The SpecC is a system-level design and specification language developed in University of California, Irvine. Since SpecC is a superset of C, we built this grammar file based on the C grammar file contributed by Mr.Doug South. SPL download Ken Beesley 2001-02-21 A modification of one of the example grammars that is part of the standard JavaCC download. The original example is /examples/Interpreter/ which implements a small language called SPL (stupid programming language). The original example parses, gets an AST tree and then interprets the tree by calling the interpret() method in the root node, which in turn calls interpret() methods in the daughter nodes. The hand-written interpreter code is therefore spread out through all the various AST class files. SQL download Ramanathane 1997-04-09 0.5 Grammar for PL/SQL inside Oracle*Forms 4.5(i.e. PlSql 1.x). SQL download Kevin Parser for Oracle SQL. STEP download Singva Ma 1999-08-18 STEP Clear Text Encoding syntax is used along with the EXPRESS language to exchange neutral files between CAD systems. The description of the syntax can be found in ISO 10303-21. Dan Suciu 0.4 Strudel is a web-site management system developed at AT&T Labs — Research. Its query language, StruQL, specifies how a Web site is constructed from the source data modeled by a data graph. No longer supported. Visual Basic download Paul Cager 2002-03-13 3.0 UPDATED: A JavaCC parser for Visual Basic, using JJTree to generate an AST. The grammar supports most VB constructs and could be used as a starting point for an ASP grammar. VRML download Koen Hendrickx Covers most of VRML 1.0 specification proposed as IEEE 1076.1. VRML Satoshi Konno 1.1 beta CyberVRML97 for Java is a development library of VRML97/2.0 applications. Using the library, you can easily read and write the VRML files, set and get the scenegraph information, draw the geometries, run the behaviors. Everyone can use the library free for commerce or an individual purpose. Now called CyberX3D and ported to Xerces. XML Patrice Bonhomme 1998-07-13 0.5 XSilfide is a client/server based environment for distributing language resources. Part of the XSilfide components is SXP (Silfide XML Parser — a parser and a complete XML API in Java). More in detail, it supports XML 1.0 (REC 1998-02-10), XML NameSpace (WD 1998-03-27), Document Object Model Level 1 (DOM Core and XML, WD 1998-04-16), XLink (WD 1998-03-03) and XPointer (WD 1998-03-03). From their project home page, follow Technology and SXP to download the package. XML Norbert H. Mikula 1997-05-08 0.97 NXP is a (validating) XML (eXtensible Markup Language) parser. (It appears that NXP is no longer public software — commercial product was available at www.datachannel.com, but this does not include JavaCC source code. The above link has the last-known public distribution version.) Norbert Mikula co-authored XML For Dummies . He died in 2009. Wang-Chiew Tan 0.9 Data extraction, conversion, transformation and integration are all well-understood database problems. Their solutions rely on a query language, either relational (SQL) or object-oriented (OQL). Unlike relational or object-oriented data, XML is semistructured, i.e., it can have irregular and extensible structure and its attributes, or schema, are stored with the data. XML-QL is a query-language for XML and is suitable for performing the above tasks. No longer supported. download Ingo Macherius 1999-08-19 1.1 This distribution contains a JavaCC generated Parser and two frontends for testing. Look at the source code for some configurable options. To change options the frontends need to be recompiled. The grammar is straightforward from the drafts. It is not optimized for speed and had little to no checking for correctness beside a tiny regression test on all examples from the W3C drafts. The grammar implements XPath/XSLT patterns as of 1999-08-13. XQuery download W3C XML Query Working Group 2001-01-26 This specification describes a new query language called XQuery (successor of Quilt), which is designed to be broadly applicable across all types of XML data sources. See Appendix G.
You can also order direct from the author. Also covers JJTree, JTB and JJDoc. It explains how to write Unicode parsers to handle a much richer character set than in traditional in languages. It covers integration with Eclipse, but not IntelliJ. The documentation for JavaCC is scattered over the web. This book helps you find it all. The book treats the reader gently. There is plenty of repetition, full explanation, examples, comments about what is going on under the hood and pointing out of pitfalls. He even tells you what the various tools he is describing are useful for. You can tell he as been around the block and is talking from hard-won experience. It is like talking with a fellow programmer over coffee. He has a very kind friendly way of writing. His only fault is a tendency to belabour the obvious. Not available in bookstores. Try the publisher Centennial books.